Last week I wrote about the evils of using jargon. I got lots of responses. It’s clearly hard for people to get outside of their ‘insider’ mindset. When we use words at work daily, they begin to seem normal (even though we may’ve never used those words before). Before working at a social service agency, I never regularly used the words “client,” “youth,” “senior,” “programs,” “services,” “underserved,” or “managed care.” If you think these words are okay to use in your external communications, they’re really not. Later in this post I’ll point you to an article by Gail Perry that explains why. These are modern jargon; words that don’t cut it if you want to differentiate yourself, demonstrate impact and inspire investment. Thanks to all of you who sent me your favorite jargon culprits. For those of you who may wish to avoid these words in your future marketing and fundraising materials, you’ll find a list of these offenders later in this post. 1. Is there a more simple word? 2. Is there a word that has more impact? 3. Is there a word that’s more specific? 4. If I took this word out, would the meaning be just as clear? More clear? 5. Does this word unnecessarily (or stereotypically) categorize someone? For another super list of jargon, check out this nifty Philanthropy Jargon Generator. Besides being a lot of fun, it’s eye opening. It quickly becomes clear that when you use jargon – and it’s worse when you string jargon words together – you leave a lot of folks scratching their heads. If head scratching is the emotional call-to-action you’re going for, then be my guest. 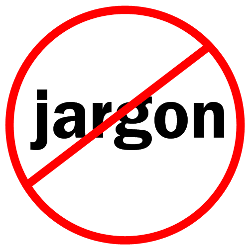 Jargon is not just acronyms and scientific language. I recommend reading The 3 Most Boring Words in Fundraising Appeals by Gail Perry. She explains why these words (which most of us have used all too often) – underserved; programs, and services — have little or no emotional impact. Modern jargon is anything that is so overused and obtuse as to have become essentially meaningless. THIS ABOVE ALL: Look for bang for the buck. Can the word stand on its own? Does the word scream for a response? Does the word make the reader feel something? Jargon is not compelling. Good writing should be compelling. Channel Ernest Hemingway’s Top 5 Tips for Writing Well. Be brief, succinct and vigorous. Don’t use a word that makes the reader want to ask: “What do you mean by that?” Avoiding jargon is really another way of saying: Be a good writer. How do you avoid using jargon? Do you have a system that works? Please share!